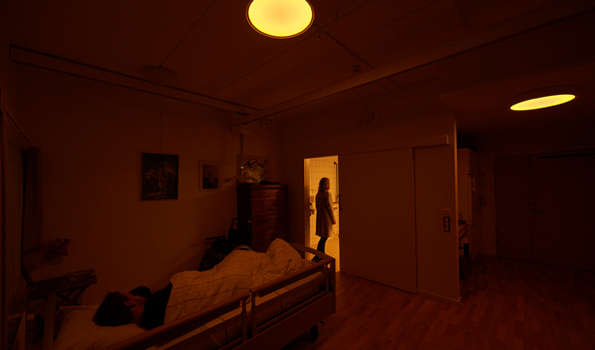 Chroma Zenit Circadian Lighting is based on a unique platform of experience and knowledge in the field of care and dementia. Since 2015, Chromaviso has worked with municipalities, doctors and professionals to create a circadian lighting that supports the demanding care environment and combines consideration for both residents and staff. 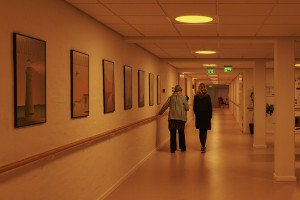 Development projects on circadian lighting for dementia – Aarhus Municipality and VIA University College (2015-2017), Lemvig Municipality (2018), Vejen Municipality (2018) and others. Chroma Zenit is used with great effect in the care sector. The light is adapted to individual needs for stimulation of the residents. Chroma Zenit is recommended by municipalities, doctors and researchers as a non-pharmacological intervention – an active part of the care environment. It has the same effect as antidepressant medicine – just without side effects. Chroma Zenit makes a difference in several nursing homes and in different situations. For example, in relation to expressive residents, mentally and physically unrest, sleep problems, depression, and wandering at night. Contact us if you want knowledge about a particular specialty. We often offer a tour at the hospitals where we have implemented lighting, so you can hear the user’s experience in the same specialty as you – and you can experience the effect of light with your own eyes. The opportunity to use the lighting to support the residents' well-being is exciting. Some residents are passive, and here we turn on our activity lights to make them more active. For example, before meals, so they want to eat more. Our hyggelys has the opposite effect. With that weget the residents to settle down and let go of fear and uneasyness. We can reassure those who may be on my way to delir. Chromaviso has developed two concepts used in the care sector – The Stimulisti Room and Circadian Lighting. 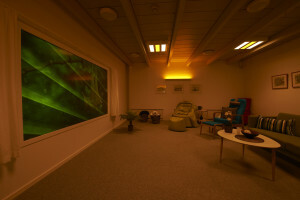 The stimuli room is based on recognized methods such as lighting therapy, snoezelen and sensory therapy, and combines the experiences from this with new possibilities in the form of an integrated set-up with television screen, content in the form of music and sounds, movies and pictures as well as therapy lighting. It is possible to transform the room into any location – a church, a boat, a beach or a forest. The stimuli room appears as a cozy living room without the focus on the technical installations. On the wall is a single touch screen, from which you can control both sound, light and film. This means that you always can access the control, without the danger of a remote control getting lost or breaking. 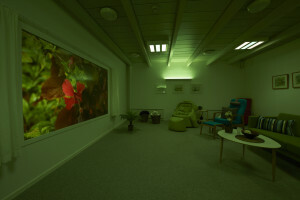 The room is lit with therapy lighting, which can be set to support the mood and activity that takes place in the room. The light is fully integrated with sound and images, but it can also be controlled from the touch screen only. 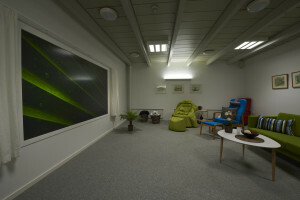 The results speaks for itself as the stimuli room has a beneficial effect on dementia – the results are based on observations of 46 residents over a period of 4 months at Demens Centrum Aarhus. 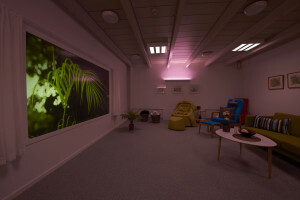 100% of the residents with reduced mood experienced a positive effect of their stay in the stimuli room. 93% of the residents who were very passive experienced that they became more alert and active by stimulation. The experience of sadness disappeared for a shorter or longer period. 63% of citizens with sleep problems and circadian rhythm disturbances experienced positive effects – they could settle down and sleep in the stimuli room. The light has an essential impact on human well-being and health. The rhythm of the light throughout the day has a central effect on our sleep patterns and derives from this a direct impact on our physical and mental well-being. 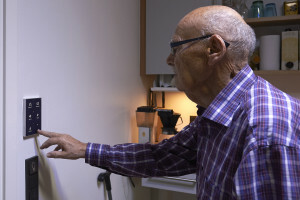 In relation to dementia, a controlled circadian lighting has a strengthening effect on sleep patterns, and this results in a positive impact on areas such as depression and agitation. We have got a light that fits our residents' needs. We can choose between two daytime rhythms - either A or B. This is because some of our residents want to sleep longer in the mornings and need the extra sleep. Chroma Zenit Circadian Lighting is an automatic controlled light that supports the natural circadian rhythm of the residents and staff. The lighting naturally blends with the outside light: It rises with the sun, it is strongest in the middle of the day and at night a specially designed wide spectrum night light turns on. Particularly the composition of light at night has a powerful effect on the sleep. It is crucial that the night light is blue-free so it will not interfere with the process of the important sleep hormone melatonin. The light has more ergonomic lighting settings, which are adapted to the department’s needs and activities. The light is easily operated via user-friendly control panels – either as a touch screen or push button. Chroma Zenit Circadian Lighting is an energy efficient solution, where power consumption is seen over 24 hours. The light is more powerful than normal in daytime to achieve a physiological effect. However, the specially developed night light uses significantly less energy than conventional installations. In total, the light uses 1.8 W/m2 in the large areas when the light is running constantly. In addition, motion sensors are used to reduce energy consumption even further.